Night sweats are experienced by many women, particularly when they reach their menopausal years. 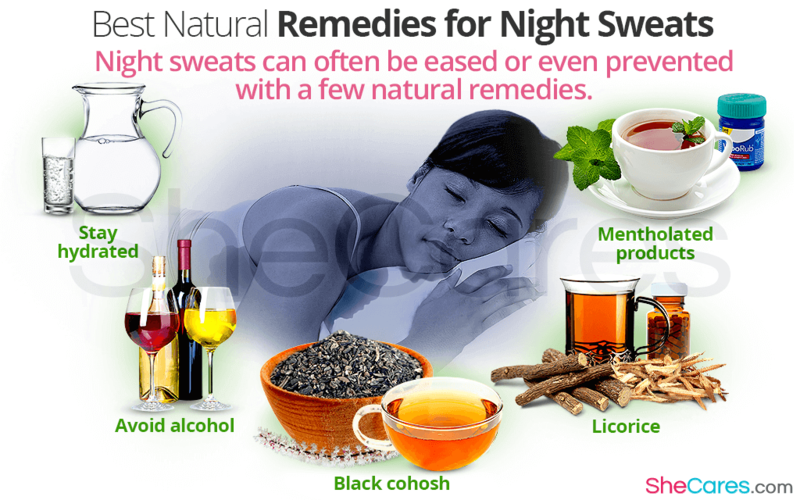 While some women prefer to look into prescribed medication and therapies to address the condition, others might first wish to consider natural remedies for night sweats. There are a vast number of these out there, and some might be more successful than others, depending on the cause of your night sweats. Read on to find out about some of the most popular remedies for night sweats. In order to support your body in its efforts to keep cool, it is important to stay hydrated. The recommended intake of fluids is six to eight glasses per day, but in hot weather - when you will naturally sweat more often and more excessively - this should be increased. Drinking fluids - especially chilled water - is highly beneficial in keeping you feeling cool, and therefore treating night sweats. Alcohol can induce sweating, especially when consumed in excessive amounts, and so if you are prone to night sweats. It is recommendable to avoid drinking it before bed in particular. This should decrease the likelihood of experiencing a night sweat, as it will be easier for your body to remain at a cool and constant temperature. Instead of alcohol, try drinking cold water, or even an herbal tea to help keep cool. This is a herbal medicine, as one of the chief menopause night sweats remedies. Studies have confirmed that it is effective in decreasing hot flashes and night sweats by around 26%. This ability is thought to be due to the presence of phytoestrogens in the plant, which can mimic the behavior of estrogen in the female body. The depletion of estrogen at this time in a woman's life is the reason for most menopausal symptoms, including night sweats. Clinical trials have confirmed that licorice can be a valuable product for the treatment of menopausal symptoms relating to body temperature - including night sweats. Licorice was administered to ninety women and the results revealed that hot sweats - which are known to be the cause of sweating at night time in menopausal women - were greatly reduced after regular consumption. Licorice supplements or tea are popular preparations of this plant. Different species of mint plant contain a compound known as menthol, which has a well-known ability to cool. Scientific research has shown us that this activity is due to the effects of the chemical on nerve endings that it meets when applied to skin. It is a considerable treatment for night sweats as it can quickly cool the body thoroughly. Mentholated vapor rub is a popular treatment, or drinking mint tea can also be worthwhile. Night sweats can be a difficult condition to contend with, especially when you are not expecting them. But many women find that regular use of natural remedies like these can be helpful for decreasing their frequency and intensity.